Our clocks have “fallen back” after daylight savings time, and this has an impact on everyone in the country, even us here in Florida. While we may not be dealing with the bitter winter winds of the North, we are experiencing shorter days that may be having an impact on your senior loved one. In fact, if the elderly person in your life has Alzheimer’s, they may experience a condition known as “sundowning.” Sundowning is common among people with dementia, and it involves becoming more confused and agitated during the late afternoon and evening. Because of the shorter days, people with this condition are experiencing more stress, anger, and confusion than normal. Therefore, it’s important to be sensitive to how this time of year can impact the elderly. Here are some steps you can take to help your senior loved one adapt to the time change. Having a routine is beneficial to anyone, but particularly elders, who feel more safe and comfortable knowing what to expect every day. Therefore, do what you can to keep on a regular schedule as much as possible. Serve meals at the same time every day, have them go to bed and wake at regular hours, and make some room to schedule physical activity and fun into their daily routine as well. Being exposed to as much sunlight as possible during this time can help keep your loved one on a regular schedule and stave off the depression that is typical during these winter months. Make a point to get outside with your senior every day, whether you take a walk, play a game, or simply sit in the backyard and take in nature. On cloudy days, you could consider setting up a sun lamp in their home so they can still receive the benefits of sunlight. Feelings of irritability or depression can make it difficult to sleep at night. This becomes a vicious cycle, as not getting sufficient sleep doesn’t help with mood problems either. One way to ensure better sleep is to keep your senior loved one active during the day. Have them participate in some sort of physical activity together, whether you take a stroll through the park or enroll them in a water aerobics class. Just make sure to keep this physical activity during daytime hours, as exercising too close to bed can make it difficult to sleep. Engaging in activities that confuse or frustrate your elderly loved one can make it more difficult for them to rest and relax in the evening. Encourage them to participate in calmer activities, such as snuggling with a beloved pet or listening to calming music. Avoid more challenging activities, such as games or puzzles, which might irritate them. At Gulf Shore Private Home Care, we specialize in home health care in Naples. 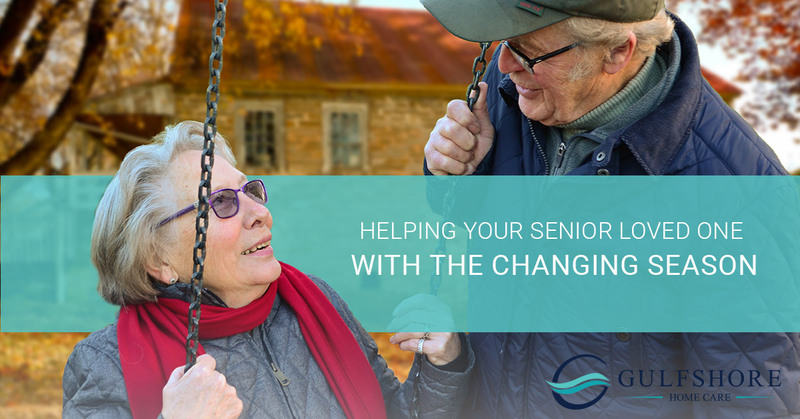 Because we work closely with the elder population, we are intimately familiar with the struggles they face during this time of year. If your loved one needs special care during this time of year, hiring an in-home health aide may help them. Contact us today to get started!